Although the world's climate has undergone many cyclical changes, the phrase 'climate change' has taken on a sinister meaning, implying catastrophe for humanity, ecology and the environment. We are told that we are responsible for this threat, and that we should act immediately to prevent it. But the apparent scientific consensus over the causes and effects of climate change is not what it appears. 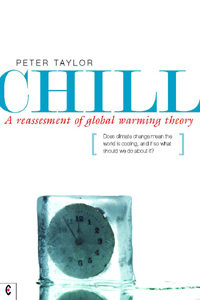 Chill is a critical survey of the subject by a committed environmentalist and scientist. Based on extensive research, it reveals a disturbing collusion of interests responsible for creating a distorted understanding of changes in global climate. Scientific institutions, basing their work on critically flawed computer simulations and models, have gained influence and funding. In return they have allowed themselves to be directed by the needs of politicians and lobbyists for simple answers, slogans and targets. The resulting policy - a 60% reduction of greenhouse-gas emissions by 2050 - would have a huge, almost unimaginable, impact upon landscape, community and biodiversity. On the basis of his studies of satellite data, cloud cover, ocean and solar cycles, Peter Taylor concludes that the main driver of recent global warming has been an unprecedented combination of natural events. His investigations indicate that the current threat facing humanity is a period of global cooling, comparable in severity to the Little Ice Age of 1400-1700 AD. The risks of such cooling are potentially greater than global warming and on a more immediate time scale, with the possibility of failing harvests leaving hundreds of millions vulnerable to famine. Drawing on his experience of energy policy and sustainability, Taylor suggests practical steps that should be taken now. He urges a shift away from mistaken policies that attempt to avert inevitable natural changes, to an adaptation to a climate that is likely overall to turn significantly cooler.